With movies like “My Big Fat Greek Wedding” it’s easy to think that Greek food is all meat, all the time. And the truth is that Greeks do know their way around a grill. But at the same time, there are hundreds of wholesome, hearty meals without a trace of meat in them. Check out the following guide to vegetarian and vegan food in Greece and discover our favorite Greek vegan and vegetarian dishes… enjoy. The most popular category of vegan foods is called ladera because they’re cooked with a lot of olive oil. A ladero dish often consists of a vegetable cooked in tomato sauce. You could have fasolakia (green beans), bamies (stewed okra), briam (zucchini, potatoes, eggplant, and bell peppers baked together with tomato sauce), or melitzanes imam (baked eggplant in a tomato sauce). Double check with the restaurant to make sure they don’t use a meat-based bouillon (usually called by the popular brand name “Knorr”). If you eat dairy, enjoy these dishes with a little feta. In any case, be sure to sop up the sauce with lots of bread. We guarantee that any ladero you pick will be tasty, healthy, and satisfying. Greeks eat a lot of stews and soups made with pulses or legumes – especially when the weather gets cold. You’ll often find a pot of fasolada (bean soup) simmering on someone’s stove. Many consider it our national dish. You can also try revythia (chickpeas or garbanzo beans), mavromatika fasolia (black-eyed peas, sometimes in a salad and other times in a tomato sauce), or fakes (lentils). Each one of these meals is chock-full of protein. Lots of traditional Greek food come in vegetarian versions as well – we call them orfana. For example, gemista are tomatoes and peppers stuffed with rice and ground beef. You can get gemista orfana (gemista orphans) without the beef. Loads of people prefer them that way (often with raisins and pine nuts mixed in), so they’ll be easy to find. The same goes for dolmadakia, which are vine leaves stuffed with rice and ground beef (sometimes in an avgolemono or egg-lemon sauce), and lahanodolmades, which are cabbage leaves stuffed with rice and ground beef. Try them all orfana-style (no meat). Just make sure you double check with the restaurant to make sure they don’t use beef-based broth or bouillon. Next up, we have vegetable-based risottos. These are usually totally vegan on their own. If you eat dairy, enjoy them with some Greek yogurt or feta cheese. Spanakorizo (spinach rice) is probably the most popular. It’s creamy and flavorful, with the rice adding a nice texture. Other traditional recipes include lahanorizo (cabbage rice) and prasorizo (leek rice). Explore local variations on the islands you visit – you’ll discover a wide range of captivating flavors. 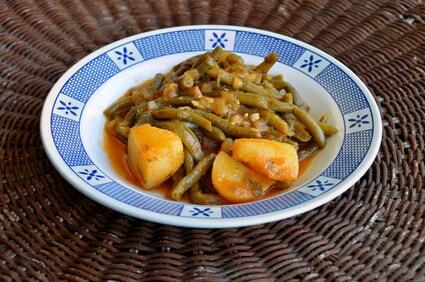 Some other delicious (but often underrated) vegan dishes include aginares a la polita (artichokes in a lemony-olive oil sauce), arakas (peas in tomato sauce), gigantes (beans in tomato sauce), and kounoupidi kokkinisto (cauliflower in tomato sauce). If you eat eggs, then try aginares avgolemono – that’s artichokes in an egg-lemon sauce. Greece is the ideal place to eat beautifully prepared but uncommon veggies. What if you find yourself at a grill house or a tavern, and none of these options are on the menu? Never fear as there are lots of fantastic options for you. It’s easy to make a meal out of appetizers. Try fava, which is a lemony dip made from split yellow peas (it has nothing to do with fava beans, which are called koukia in Greek), or melitzanosalata (a spread made from charred eggplant or aubergine). Restaurants sometimes add a little mayonnaise to melitzanosalata, so double check before ordering. Skordalia is a vegan garlicky dip made with pureed potatoes or bread. It usually accompanies fried salt cod, but it’s delicious with patzaria (boiled beets). If you eat dairy, you can’t go wrong with tzatziki – a yogurt dip with lots of cucumber and garlic. And that’s just the beginning. Most fried foods are vegetarian, if not totally vegan. Ask for kolokithakia tiganita (fried zucchini or courgette), patates tiganites (french fries! ), tyri saganaki (fried cheese – what’s not to love? ), or kolokythokeftedes (fried zucchini balls). These are all terrific meatless options. Sometimes, the vegetables may be fried in an egg batter, but more often it’s just flour – as always, double check before ordering. You just can’t go wrong with simple boiled veggies. Horta are wild greens, patzaria are beets, and kolokithakia are zucchini. Try them with some dip. Finally, keep in mind that you can ask for a touristiko gyro (a tourist gyro) to get a gyro without the meat – that’s tomatoes, potatoes, onions, and tzatziki. Just ask the restaurant what they have. And always check before you order – sometimes there’ll be eggs (avga in Greek) or milk (gala in Greek) or a beef-based bouillon cube hidden in the batter. If you mention Knorr, a popular bouillon brand, they’ll understand what you mean. In my experience, people are usually confused when you want a whole meal without any meat in it, but they always have lots of options for you. They’ll be excited to share the undiscovered gems of Greek cuisine with you. We hope you love Greek food as much as we do. Kali Oreksi! Are you interested in learning how to cook Greek food? Would you like to find more about Greek food and taste typical Greek dishes? Kids Love Greece has a network of trusted partners which organize cooking lessons and food tours. See all our food related tours HERE. THANK YOU !!!! I’m going to Greece (Kefalonia) in 2 days so I noted everything you said in here haha, I hope I won’t starve :D Thank you so much for this post, so many great information and vocabulary ! Thank you for your email. You will have a blast in Kefalonia… there is no way you will starve! Trust us!